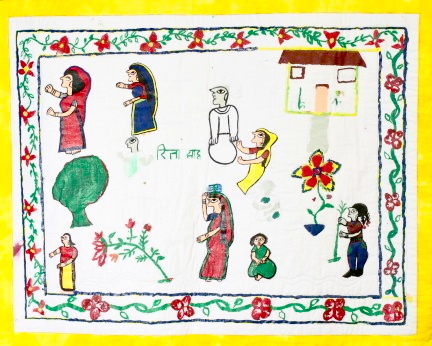 In 2010, Peace Fellow Kate Bollinger worked with her host organization, the Women’s Reproductive Rights Program (WRRP), to help survivors of uterine prolapse tell their story through painting. 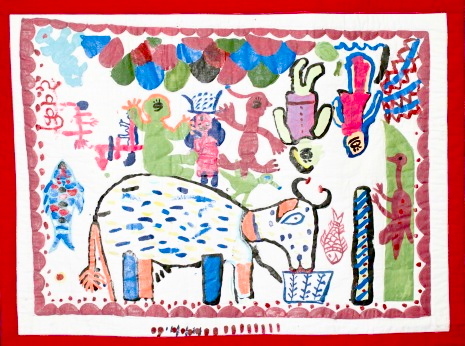 The artists produced about 40 paintings onto fabric. 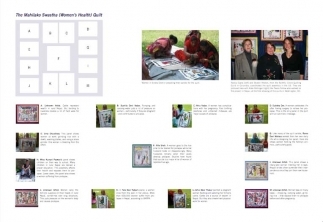 These were then brought to the US and assembled into three advocacy quilts which have been used to promote WRRP’s work through exhibits around the United States. 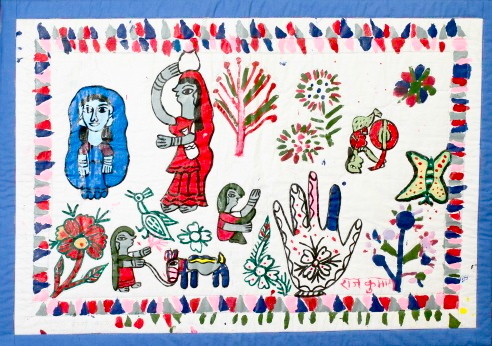 Mithila Art: The squares were painted onto fabric in the Mithila style of art, which has been in use in Nepal and northeast India for centuries. 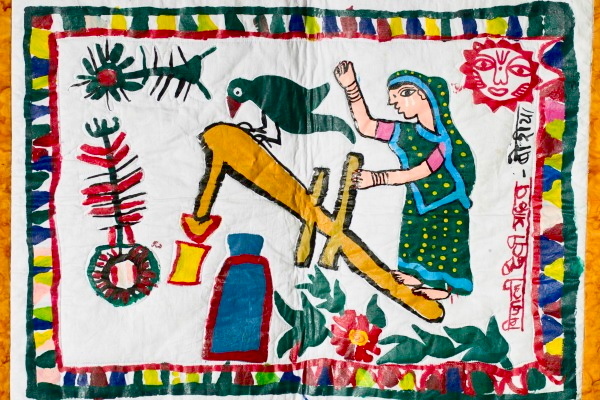 This painting by Bijili Yadav shows a women at work on a dekhi, which is used to grind rice and puts great pressure on the woman’s uterus. 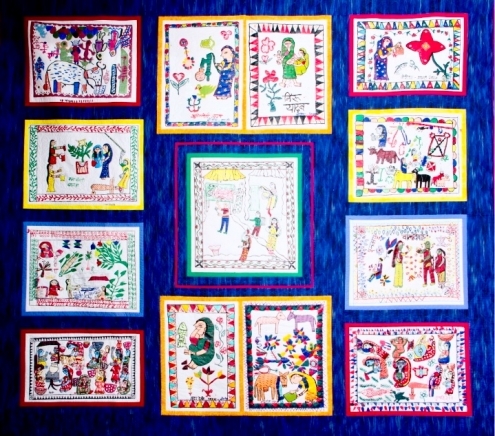 Another artist, Phulo Devi Pahwan, said, “I have never done these kinds of paintings. I never handled a brush before the day we started this. I was wondering if I could do it or not. 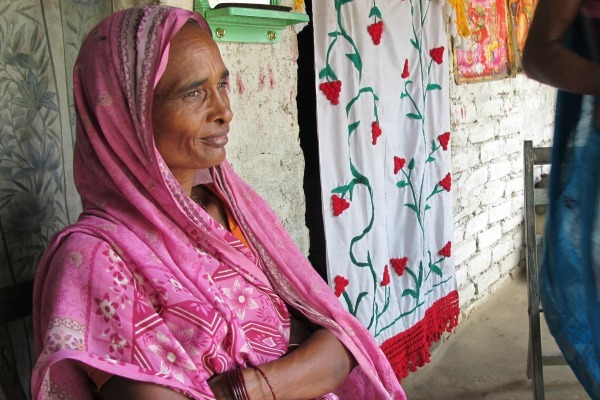 Now, after three or four days, my hands have become stable and it became easier.” Bijili Yadav said: “I used to weave baskets and prepare fuel from cow dung. But I have never done these kinds of paintings.” Many of these women expressed a strong desire to continue painting. 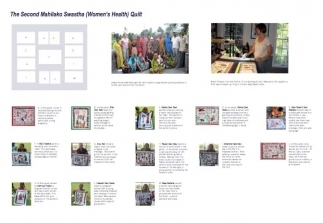 They chose the name of Mahilako Swastha (“women’s health”) for their quilts. Kate (photo) brought the paintings back to the US in October 2010, and AP then took them to the Faithful Circle Quilting Guild in Maryland Columbia, which had helped with the Congolese quilts and has many very skilled members. Sharon Rhoton, the Guild president, again took charge and identified three other volunteers – Nancy Evans, Alka Mital, Maria O’Haver. The paintings were large and the decision was taken to make large quilts. While this would limit the space where they could be shown, the size would be imposing and eye-catching. Our quilting friends came up with many small refinements, including the insertion of a red band to offset red in some of the paintings. Maria rounded off the process by quilting around the figures within each painting so as to hold the paintings close to the backing. This was enormously time-consuming, but provided a wonderful finishing touch. Assembling the Quilts: The Mahilako squares were attached to backing by Maria O’Haver, from the Faithful Circle Guild in Columbia Maryland. 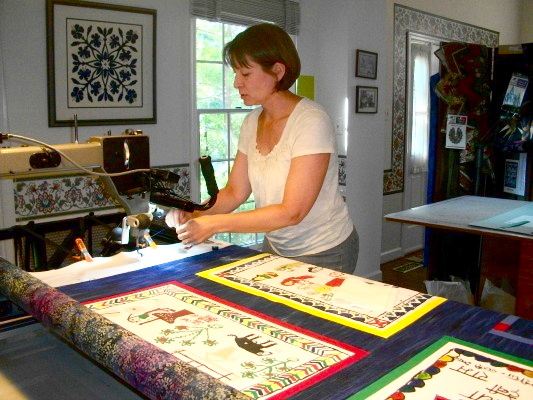 The whole process took several months, and it was not until December 2011 that the quilts were first put on display at the Pilgrim’s Church in Washington. 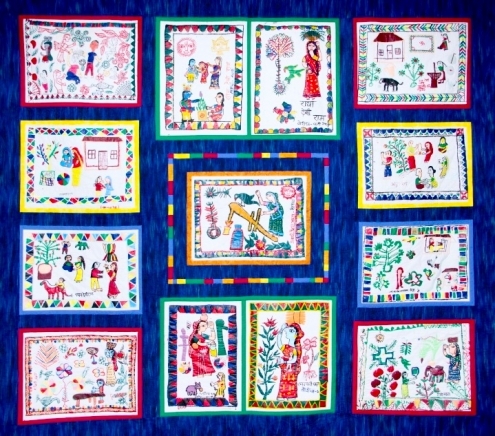 The two large quilts were then prominently displayed at the March 8, 2012 exhibition of advocacy quilts at the UN, held to commemorate International Women’s Day. An estimated 80,000 visitors viewed the exhibition. The quilts were again displayed on several occasions in 2012, culminating in an important meeting at the Wilson Center in Washington. 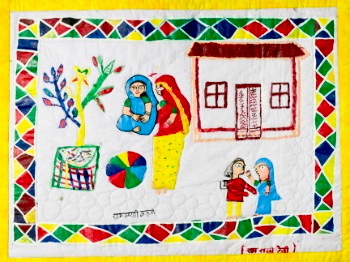 The event was organized to explore possible linkages between prolapse and fistula, and the quilts made a powerful case for not ignoring prolapse. 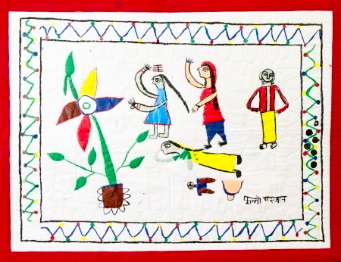 Between January and September of 2013, the quilts were exhibited at Kean University where they attracted the attention of experts from the Kean School of Nursing. One of the quilts was again shown at the Texsquare Museum in Washington in December. Among the audience was Kate Bollinger, who had done so much to produce the panels, and three quilters from the Faithful Circle Guild, who had assembled the final quilts. 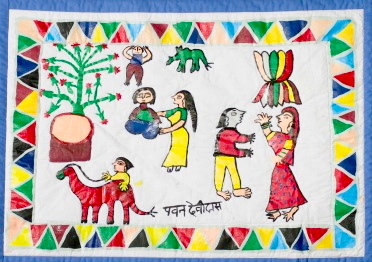 Alka Mital, one of the trio, looked on in appreciation as a doctor used the quilt to describe the many and varied horrors associated with prolapse. The story of the quilts was coming full circle! 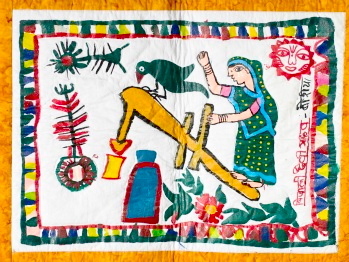 Uma Chaudhary painted scenes of women at work – grinding rice with a dekhi, washing dishes, and using a stone grinder. One woman is bleeding from the effort. 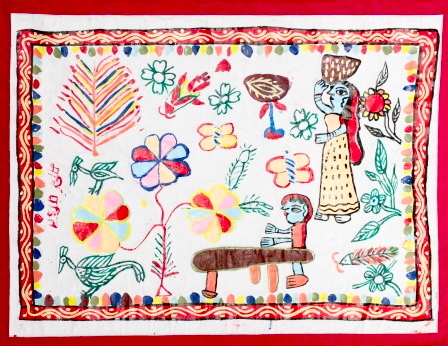 Mina Kumari Paswan painted children on their way to school. 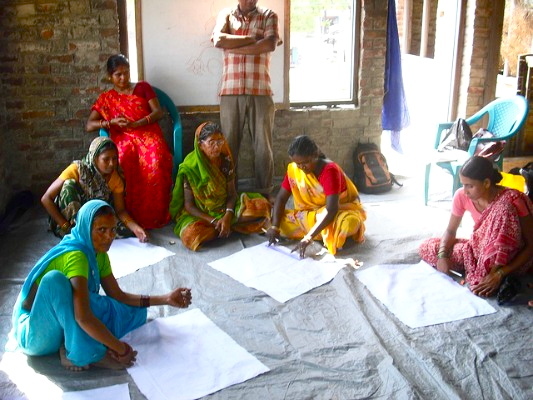 Education is a privilege not often enjoyed in the villages in the Siraha District. On the bottom of the panel, a woman suffers from prolapse. 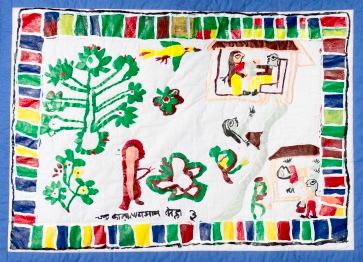 Sushila Devi Yadav painted this panel to show how hard women must work every day. Pumping and carrying water puts a lot of pressure on women – particularly if they are pregnant – and contributes to prolapse. 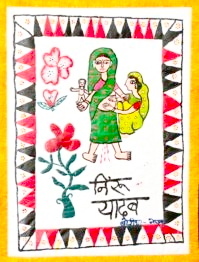 Rita Shah painted a woman going to the hospital to be treated for prolapse. Her husband looks on disapprovingly. Women with prolapse are often shunned by their husbands and families. Many husbands will seek another wife. In Niru Yadav’s panel, a woman has complications with her pregnancy. Poor birthing practices and untrained midwives are a major cause of prolapse. 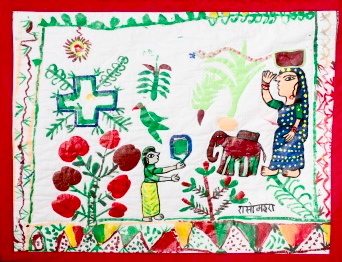 Arhul Devi Thakur painted a pregnant woman feeding and watering her family’s cattle. Among their many daily chores, women tend to the livestock. Although cattle are a sign of wealth in Nepal, they add to the manual labor carried out by women every single day. 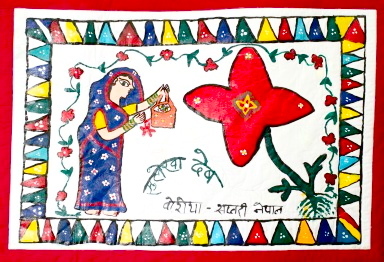 Sulekha Dev painted a panel that conveys her sense of optimism for the future of women in Nepal. The woman in this panel celebrates life after having surgery to relieve her prolapse. 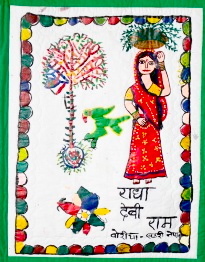 Ramo Devi Mahara, like many other women, depicted scenes from her daily life. In this panel, the women spend most of their day herding the family’s animals,particularly goats. 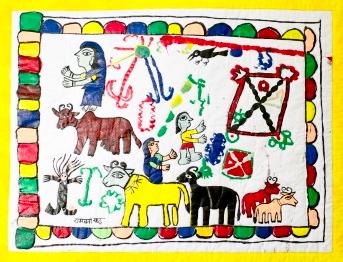 This panel depicts cattle, which represents wealth for the family. Tending them, however, creates a substantial amount of manual labor for women in Nepal. 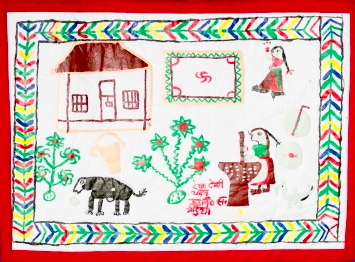 This panel shows women suffering as they go about their daily chores. In Nepal, women are responsible for carrying food and other supplies for the house on their heads, sometimes over long distances. This puts pressure on the woman’s body and causes prolapse. This panel shows a newly married woman meeting her in-laws. Upon marriage, young Nepali women surrender their independence as they join a new household. 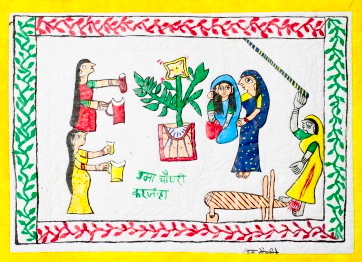 This panel depicts the many tasks that women do on a daily basis – chopping, carrying water, grinding rice. All of these chores expose women to prolapse before and after pregnancy. 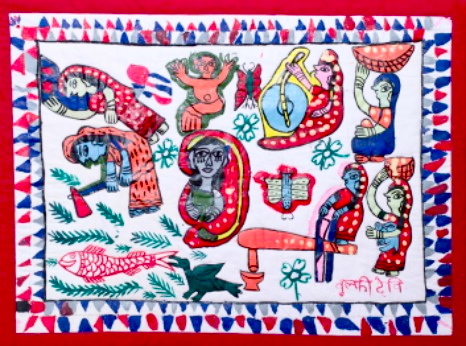 Ram Shakhi Devi Mahato chose to depict a newly-wed woman and her mother-in-law. Women have little control over their lives once they enter their new homes after marriage, often at a very young age. 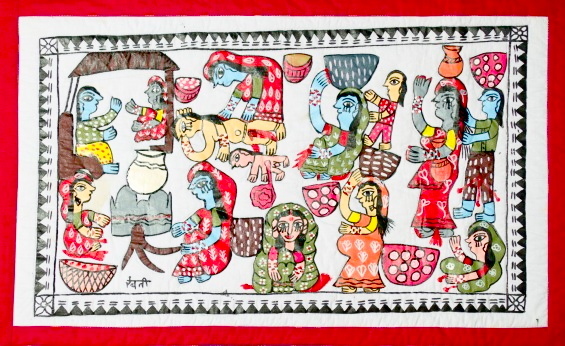 Pawan Devi Das depicts a number of daily chores in her panel. 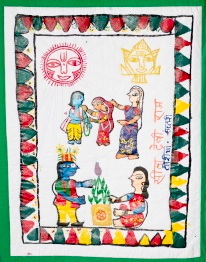 In the center, a woman is carrying her baby. 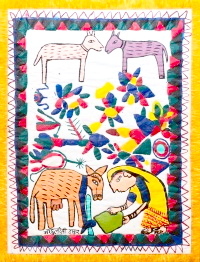 At left, another woman guides a donkey. Manual labor is a major cause of prolapse in Nepal, as women work from dawn to dusk to provide for the household. On the right, a yong woman is courted by her husband-to-be. In this panel, Sita Devi Ram depicts a young couple getting married to the music of a geethar (Mithili wedding singer). Early marriage is another prime cause of prolapse. 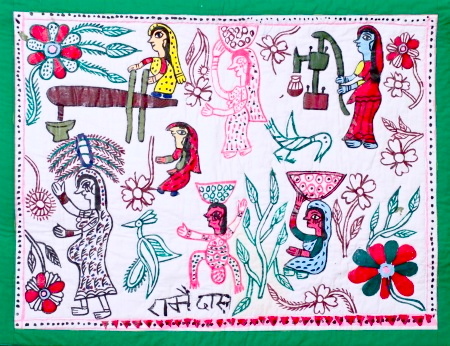 In Bijili Yadav’s panel, a woman grinds rice with a dekhi. This work takes enormous effort and is a major cause of prolapse among pregnant women. 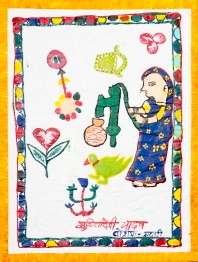 In this panel painted by Aahiliya Thakur, a pregnant woman pumps and hauls water as part of her daily tasks. This takes effort and puts pressure on the women’s abdomen. Radha Devi Ram painted a woman carrying a heavy load of grass on her head. The woman is crying out from stomach pain but she must continue her work. Carrying puts pressure on the woman’s uterus. 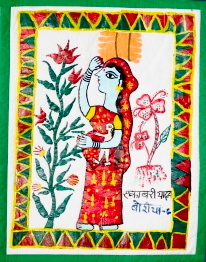 Ekawari Devi Yadav depicts a pregnant woman with a young baby collecting firewood and carrying it home on her head. Many women return to household chores within days of giving birth. 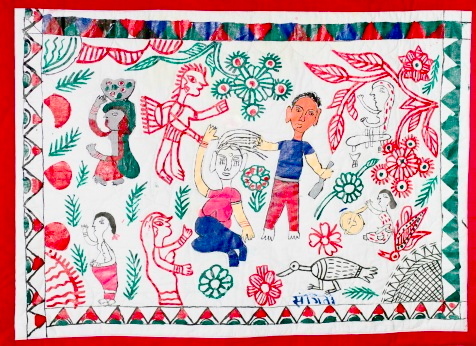 In her panel, Rekha Devi Yadav painted a woman with prolapse working alone and grinding rice by hand. United Nations studies have found high rates of loneliness and suicide among women of childbearing age in Nepal. 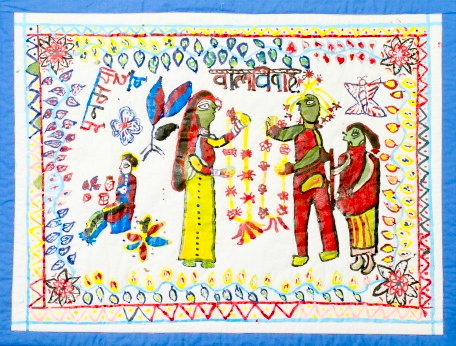 Anju Rai chose to depict a familiar scene in Nepal: child marriage. Two women grind rice by hand in the forefront as a young girl is married off to her husband in the center. 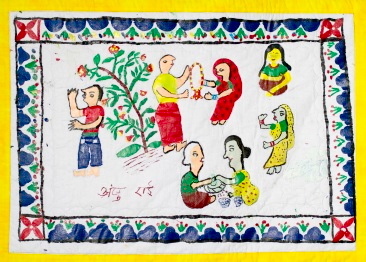 Chandra Kala Devi chose to paint a normal day in the life of a Nepalese woman. After working, a woman leaves the fields for home, where she serves her husband food while thier two sons play in the field. 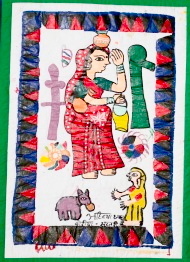 Raso Mahara painted a woman carrying goods home from the market on her head. She is pictured with animals of the forest – a parrot, elephant and snake. In this panel, a man is depicted beating his wife. Domestic violence is a large contributing factor of uterine prolapse, particularly during pregnancy. 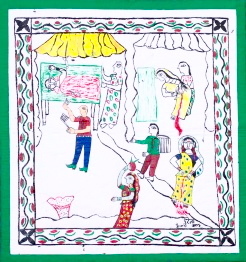 In this panel, daily chores are carried out by women and children. At the top right, a woman carries food on her head, while her son grinds rice on a dekhi, a traditional tool used to grind grains. In this panel, a young woman is shown pregnant. The minimum legal age for marriage is 18, but some girls marry as young as 10. Early marriage is a prime cause of prolapse because girls find it difficult to support birth. Household chores pose a threat for women. On the bottom center of this panel, a woman is shown with an extended uterus. Some women live with the condition for years. 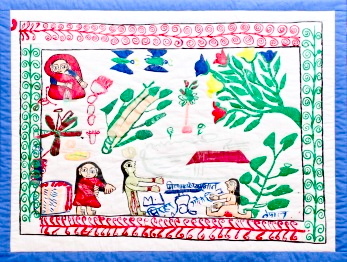 This panel depicts household activities which lead to prolapse. The henna tattoo is particularly popular with brides. These posters can be downloaded and printed. Click on the images below.